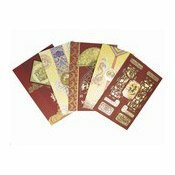 Description: 5 Assorted Luxury Chinese New Year cards hand-finished with golden lattice-work and intricate detailing (picture for illustration purposes only - designs may vary from those shown). Cards feature various Chinese New Year images and messages in English and/or Chinese. Simply enter your details below and we will send you an e-mail when “5 Luxury Chinese New Year Cards (新年賀卡)” is back in stock!